Click on the picture for a flyer with more information. Jetsetyet and her Chapel Royal filly. This is a big, good looking filly (at right). She has a bright look in her eye and appeared to be very athletic. The owner did not have her as part of the horses listed as he is going to continue to race, he just wants to liquidate his breeding stock. The owner did say he would consider a reasonable offer (expect that to be in the $100,000 range). The mare has age and is on a short cover date (not palpated in foal yet to a late May cover to Northern Afleet). She is noticeably offset in her knees, particularly her right front, but her joints are clean and her production record indicates that her babies have not been adversely affected. The baby will be worth the price of the package if she develops to her current projections. Mare is priced at $30,000 if she is in foal (stud fee paid). Glorious Halo in foal to Master Command. You can see from the picture that this is a big (16 hands and ½ inch) stout mare and the stud fee is paid. Bred to Master Command, Glorious Halo’s baby will be line bred to Secretariat with a dosage index of 3.40. This young mare has two other foals that could provide winning updates by the time this foal is ready for sale. Price $45,000. 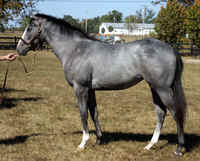 There is also a Friend's Lake yearling out of this mare that is for sale. We will have pictures of this yearling later this week. Shamoiselle is a granddaughter of Seattle Slew and is in foal to Officer. Price is $45.000. 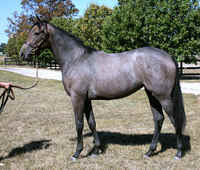 This mare also has a yearling by Friend's Lake that we have just listed for sale.